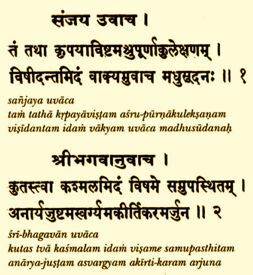 Sanskrit is the ancient language the Vedas were composed in. It is the root of many Indian languages, and continues to be used as a language of religion and scholarship. Spiritual writings such as the Bhagavad-gita, Srimad-Bhagavatam, the Upanishads, and Vedanta-sutra, as well as epic historical poems like the Mahabharata and Ramayana, are composed in Sanskrit. Its written form is known as Devanagari, "language of the cities of the demigods." Sanskrit is a precise and complex language, with rules that require years of training to learn. Some scholars consider it the mother of all Indo-European languages. The foremost Vedic scholar and teacher of the modern era, His Divine Grace A.C. Bhaktivedanta Swami Prabhupada, wrote over eighty volumes of Sanskrit translation and commentary. Aware that his reading audience would likely include scholars as well as spiritual seekers, he set publishing standards that would establish the authenticity of his literary work. Each of his books includes the Devanagari script for each Sanskrit verse, Sanskrit-English word-for-word equivalents, a standardized Roman transliteration of each Sanskrit consonant and vowel sound, and a Sanskrit pronunciation guide in the glossary. Mantras in your Home - how to add some Sanskrit to your life, somehow or other. The Pastimes of Scholarship - Chaitanya Mahaprabhu's brilliant academic career as a Sanskrit scholar. "Samskrita means 'reform,' and the alphabet is called devanagari. As Roman letters are used in European languages, similarly, in the upper planetary system, the cities of the demigods, this alphabet is used. The language is called Sanskrit, or Samskrita, 'most reformed' It is the mother of all languages. Even on this planet, Latin is derived from Sanskrit; just like "maternal," the matri-shabda, and "paternal," pitri-shabda. . ."
"The Sanskrit language, Devanagari, is spoken in the higher planetary system, even in Vaikunthha (the spiritual world). Nagara means city, and the citizens are called nagari. As Tokyo may be called 'Japan-nagari,' this alphabet's letters are called devanagari, and in the cities of the demigods, this language is spoken - Devanagari." "In all of my other books – Srimad-Bhagavatam, Sri Isopanisad, etc. – the system is that I give the original verse, its English transliteration, word-for-word Sanskrit-English equivalents, translations and purports. This makes the book very authentic and scholarly and makes the meaning self-evident. I was not very happy, therefore, when I had to minimize my original manuscript. But later on, when the demand for Bhagavad-gita As It Is considerably increased, I was requested by many scholars and devotees to present the book in its original form." ". . .This book (Bhagavad-gita As It Is ) is then a welcome addition from many points of view. It can serve as a valuable textbook for the college student. It allows us to listen to a skilled interpreter explicating a text which has profound religious meaning. It gives us insights into the original and highly convincing ideas of the Gaudiya Vaishnava school. In providing the Sanskrit in both Devanagari and transliteration, it offers the Sanskrit specialist the opportunity to re-interpret, or debate particular Sanskrit meanings—although I think there will be little disagreement about the quality of the Swami's Sanskrit scholarship. . . "
by Professor Edward C. Dimock, Jr.
"Nagara means town, and deva means demigod. This language is spoken in the heavenly planets, deva-nagara. But these rascals, they think there is no living entity in any other planet except this (Earth)." Is it possible to prove that Sanskrit really is the "mother of all languages"?